Protein has been a hot topic for a long time and consumers’ interest in foods containing high levels of protein is ever growing. Protein has become more than just a “special” dietary component used by muscle builders and is now moving further into mainstream markets. Consumers are generally becoming more health focused and their interest in protein fortified products is increasing due to the vast amount of publicity around the beneficial properties of protein. It is now down to the food manufacturers to produce products high in protein without compromising on taste, texture or quality. Protein is added to foods in the form of a protein hydrolysate. Whilst there are many sources of protein, the ease with which the protein can be ‘unlocked’ and the quality of the protein extracted varies hugely. Therefore, a protein source such as eggs, whey or similar, which has the ability to produce better quality protein hydrolysates is sought after. Protein hydrolysate manufacturers, no matter what the substrate, want to produce the holy grail of protein hydrolysate – a high quality, non-bitter product with a degree of hydrolysis less than or equal to 10%. Using enzymes in the hydrolysis process can negate or reduce the need to use strong masking flavours, which very often limit the flavour selection of end products. Sometimes it is necessary to combine more than one enzyme to produce the best possible result for your product and this is where enzyme specialists, such as Biocatalysts Ltd, can add significant value to your end product. Take, for example, egg white hydrolysates. Eggs are naturally high in protein and have always been a staple part of a balanced diet. Ovalbumin, which is the most abundant protein in egg whites, is relatively easy to digest and is efficiently absorbed into the body. 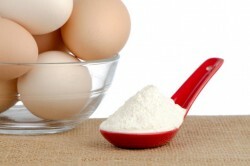 This makes egg whites a good source for the production of protein hydrolysates for fortifying into products. Egg white hydrolysate manufacturers, however, regularly come up against the problem of bitterness. Protein hydrolysates very often have a bad taste which means masking agents are required. This usually results in the final protein hydrolysate having a bitter taste. This isn’t ideal as it means the taste of the final product would alter. Biocatalysts offer a range of enzymes to improve protein hydrolysates. Flavorpro™ 786MDP can help to hydrolyse egg white proteins to provide bland and non-bitter tasting hydrolysates. This bland flavour allows the hydrolysate to be added at higher concentrations in the end product without the need for bitter masking agents. Flavorpro™ 786MDP also helps to reduce the size of egg white proteins, which makes them easier to digest and absorb into the body, particularly muscles. This makes the egg white hydrolysate an ideal source for sports and athletic nutrition. Flavorpro™ 786MDP can also be used in combination with other enzymes, such as Flavorpro™ 937MDP, if an egg white protein hydrolysate with a high degree of hydrolysis is desirable. Take a look at Biocatalysts’ technical bulletin on the use of enzymes for egg processing to find out more. It’s not just egg white hydrolysates that can be improved by the use of enzymes. The same can be achieved for whey, vegetable and other protein hydrolysates. These different sources of protein will continue to battle it out to capture the market share of this increasing trend. One thing will remain the same, the power of enzymes to create high quality, neutral flavoured protein hydrolysates that are easily absorbed into the body. For further information on Biocatalysts Ltd and their enzyme product offering, visit www.biocatalysts.com.